A Bone Mineral Density test (BMD) is the only way to diagnose osteoporosis and determine your risk for future fracture. Since osteoporosis can develop undetected for decades until a fracture occurs, early diagnosis is important. A BMD test is a special type of test that is accurate, painless and noninvasive. It measures the density of your bones (bone mass) which is necessary to determine whether you need medication to help maintain your bone mass, prevent further bone loss, and reduce fracture risk. We use an Osteometer DTX-200 DEXA scanner to conduct your test in our mobile lab. This service takes about 10 min and provides a very accurate assessment of your bone density. At most facilities this test costs typically $75-$150. However, we charge only $49. Many health insurance providers will pay for the cost of this test. Currently we do not accept insurance but please check with your insurance company about cost reimbursement. 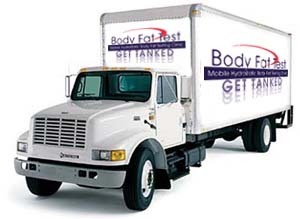 Within our mobile lab we also provide hydrostatic body fat testing. Hydrostatic means we use water displacement to determine your body density and thus your body composition. Bone density is a critical part of your 'lean mass' and therefore plays a key role in your body fat percentage. The higher your bone density the lower your body fat percentage. We are excited to offer both of these tests in a mobile setting. Now affordable bone density testing is available to everyone. If you are interested in receiving both tests we provide a discount of $10 for a total price of only $88.00.